Written by Forest Pines; published at 10:29 am on July 3rd, 2009. 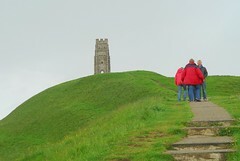 Talking of summer storms: we popped down to Glastonbury the other month, for a poke around the bookshops, and for a walk up to the top of Glastonbury Tor. As we did so, the heavens opened, and we, and all the other tourists making the climb, got soaked. 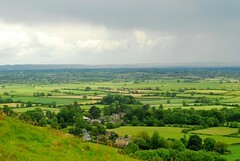 We watched the storm motoring its way off across the Somerset Levels, away to soak the distant hills.